We all know the statistics about air travel. How it’s so much safer than driving a car. How the number of people dying in plane crashes grows smaller every year, while the number of people who survive them grows larger. How, despite recent news, plane travel continues to get safer and safer every year. Yet who among us does not squeeze the arm rest just a little tighter during take-off and landing? Driving a car at least provides an illusion of being in control. There’s no such illusion strapped into a plane seat. 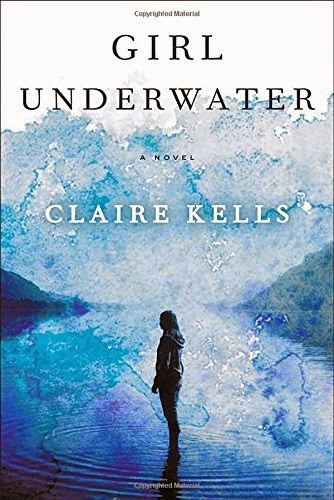 For Avery Delacorte, the protagonist of Claire Kells’ Girl Underwater, the airplane that takes her and her college swim teammates, Phil and Colin, from their California school to their hometowns near Boston, only represents the six hours in between her and reuniting with her family for Thanksgiving. Sophomore Avery finds Colin, a powerful senior, particularly intimidating, and is dismayed when he plops down on the seat next to her. But when the flight goes down somewhere in the Rocky Mountains, she’s glad that calm, strong Colin was her seatmate. Avery and Colin help three small boys out of the plane; Colin carries an unconscious pregnant woman on his shoulder. They’re the only survivors, and they watch the plane sink into an enormous, cold lake. Luggage floats nearby, but the lake is cold and the swimmers are hurt. They’re in the middle of nowhere and winter is coming. How will they survive? While structured differently, Girl Underwater reminded me a lot of Tracey Garvis-Graves’ novel On the Island, as both books made me think about how long I’d survive in such conditions. Maybe about eight hours. I don’t know how to make a fire from two sticks, or stitch a wound together, or which mushrooms are safe to eat. Books like these are not only entertaining, they’re survival guides. But structure is key in differentiating these two books. While On the Island (soon to be a major motion picture!) was told in a linear fashion that kept readers wondering if there would ever be an "Off the Island," Girl Underwater alternates between the plane crash and its immediate aftermath with Avery’s story a month later, as she tries to physical and mentally recover. The boys are hospitalized but okay, while Colin is still in critical condition and being transferred to a hospital closer to his home. As this structure reveals itself within the first few chapters, I’m not giving anything away by describing it. I did, however, wonder why author Kells chose to tell the story this way. As it’s told from Avery’s first person point of view, it seems obvious that all five crash survivors go on to survive their five-day stranding. The mystery then boils down to simpler questions about why Avery doesn’t want to see the boys or Colin again. What exactly happened while they were stranded? Why does she feel so guilty? What is she hiding? Many readers take up the hobby to be transported to happier, more romantic places – Elizabethan England, high school romance. Then there are those of us who read to go to those bad places – haunted houses, war, desert islands, plane crash aftermath. These books show that not only can man triumph over nature’s worse impulses, we can also triumph over our own. I'm adding "On the Island" and "Girl Underwater" to my to-read list. Great and honest review! Do you know when "On the Island" is coming out on film? I just want to make sure I read the book before the movie comes out. Thanks. This sounds really good - just pinned the cover to my Books I Want to Read board :).